President and founder, has degrees in computer science and media production. He began his career at Berkshire Community College in Massachusetts as director of media operations. He was then hired by Pratt & Whitney's Advanced Design Aircraft Engine Division, as a media specialist and created computer controlled multimedia presentations. He left P&W to become an independent corporate computer consultant and traveled the globe designing computer production controls for large manufacturing companies. Vitale moved to Franklin, NC where he continued to be a corporate consultant. His interest in the science and nature of water brought him in contact with Robert Hubbs. It was not long after that meeting when he began collaborating. Vitale now handles all of the waterwheel designs and the manufacturing requirements in the productions of waterwheels. 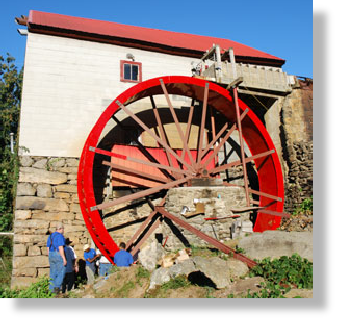 For over 5 generations the family of Robert Hubbs has been dealing with and working in waterwheels. 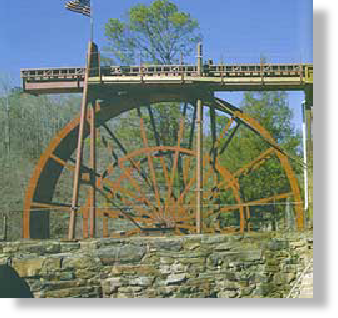 A Master Electrical Contractor by trade, Hubbs had researched, the science of building, and running waterwheels for over 30 years. Hubbs' studies led him to collect and research old manuscripts from over three continents. He has pulled from the original manuscripts of Jean V Poncelet, one of the earliest waterwheels design among along with other masters in his quest to understand the principles of waterwheels. He has consulted with hundreds of people to determine the best operational designs, and has designed numerous waterwheels for clients all over the country. His studies also led him to understand the nature of water power and the forces involved in the relationship to nature. With this understanding, he has been able to unite and work with the different forces of natures resulting in beautiful waterwheel designs which are highly efficient. Robert Hubbs past away at Age 73 in March, 2002.